It’s been a couple years now since Lisa wrote about fresh cherries, plain and simple, and that’s how I like them best, too. 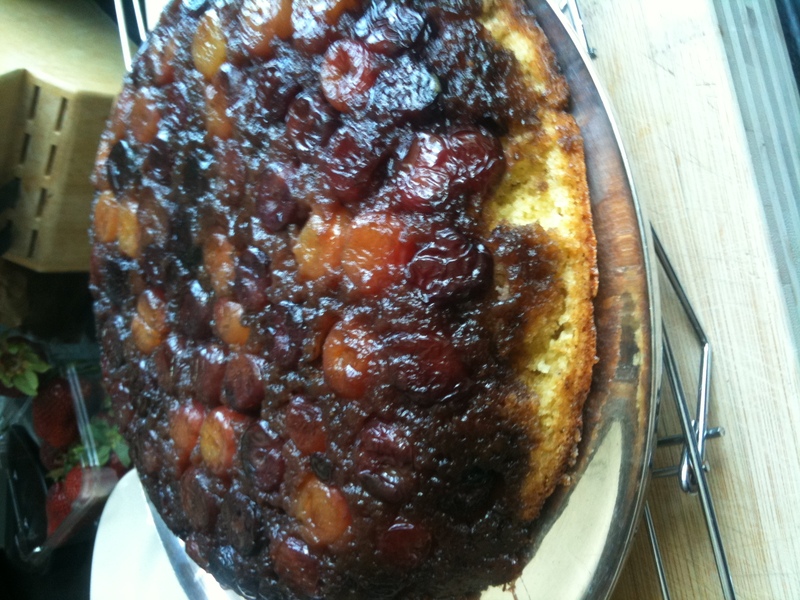 But this year, having signed up for an all-fruit CSA, we’ve been inundated with cherries, more than anybody wants to eat, so I’ve been exploring cake. 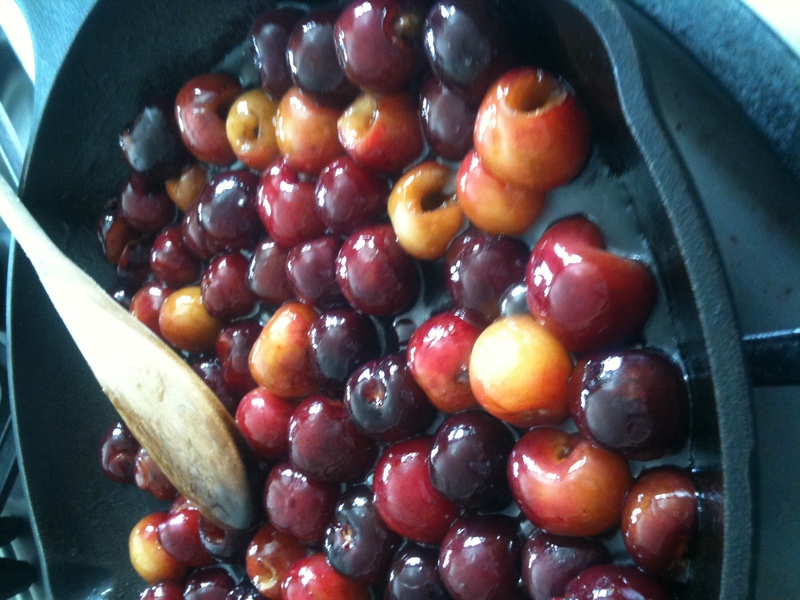 It’s not, I know, the traditional direction to go with cherries; why not clafouti, or a pie? Because I felt like cake. 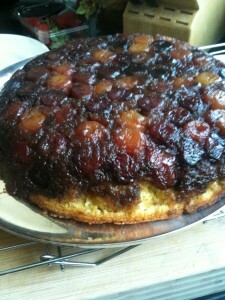 So, here’s where I started: cherry-cornmeal upside-down cake. Bake cake until top is golden brown and tester inserted into center comes out clean, about 45 minutes. Cool in skillet on rack 5 minutes. Run spatula around edges of cake to loosen. Place large serving platter upside down atop skillet. Using pot holders or oven mitts, firmly hold platter and skillet together and invert. Leave skillet atop cake 5 minutes. Remove skillet. Stick back any wayward cherries. Let cake cool at least 45 minutes. Cut cake into wedges and serve slightly warm or at room temperature. 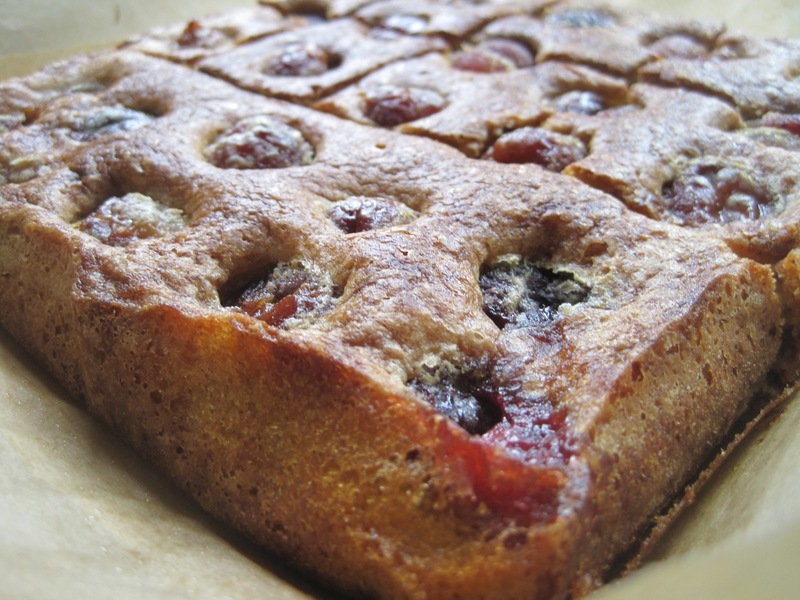 Cherry cake #2, or Cherry Brown Butter Bars, came via the always-fabulous blog, Smitten Kitchen (oh, look; she made the cherry cornmeal upside-down cake, too!). She had me at brown butter. Make crust: Preheat over to 375°F. Cut two 12-inch lengths of parchment paper and trim each to fit the 8-inch width of an 8×8-inch square baking pan. Press it into the bottom and sides of your pan in one direction, then use the second sheet to line the rest of the pan, perpendicular to the first sheet. Congratulations! You’ve just faked a square tart pan. 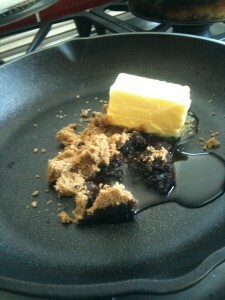 Melt the butter in a small saucepan, then add the sugar and vanilla and stir. Add flour and salt and stir until incorporated. Transfer dough to your prepared pan, and use your fingertips to press the dough evenly across the bottom of the pan. Bake the crust until golden, about 18 minutes (it will puff slightly while baking). Transfer crust to rack and cool in pan. Maintain oven temperature. Make the filling: Cook butter in heavy small saucepan (a lighter-colored one will make it easier to see the color changing, which happens quickly) over medium heat until deep nutty brown (do not burn), stirring often and watching carefully, about six minutes. 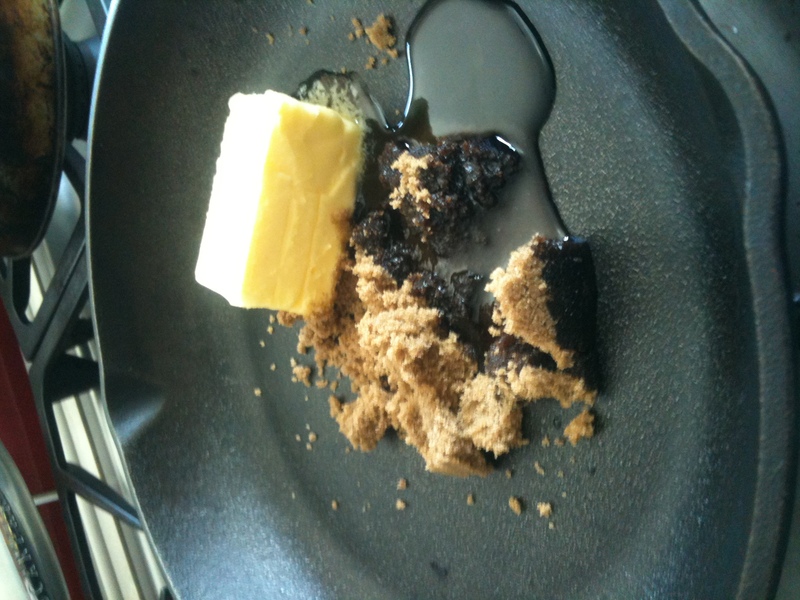 Immediately pour browned butter into glass measuring cup to cool slightly. 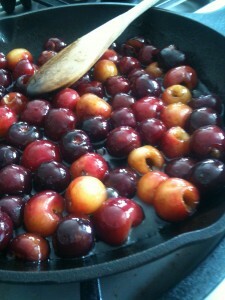 Arrange pitted cherries, or the berries of your choice, in bottom of cooled crust. Carefully pour browned butter mixture evenly over the fruit. Bake bars until filling is puffed and golden and tester inserted into center comes out clean, about 40 minutes. Cool bars completely in pan on rack. Use the parchment paper overhang to carefully remove cooled bars from pan and place them on a cutting board and cut them into squares with a very sharp knife. I’ll make this again, and I’ll vary it, too, by topping this easy pastry with lemon custard, or lemon custard + raspberries, or blueberries… the possibilities are nearly endless. Yum! I see one or both of these in my future…very soon!